Welcome back once again! It's hard to believe that today is already the last day of the Winter Coffee Blog Hop, but it is. 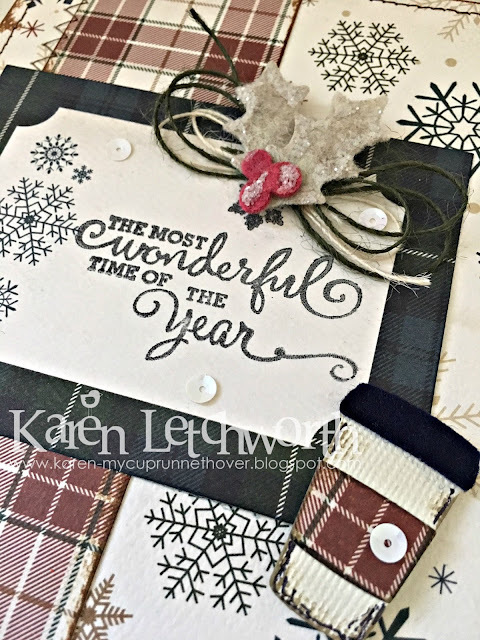 I've had a lot of fun creating and sharing my cards, and I hope you've enjoyed seeing all the fabulous creations shared. One thing is for sure...we all love our coffee! This card was made using some patterned papers from Carta Bella called Cabin Fever. 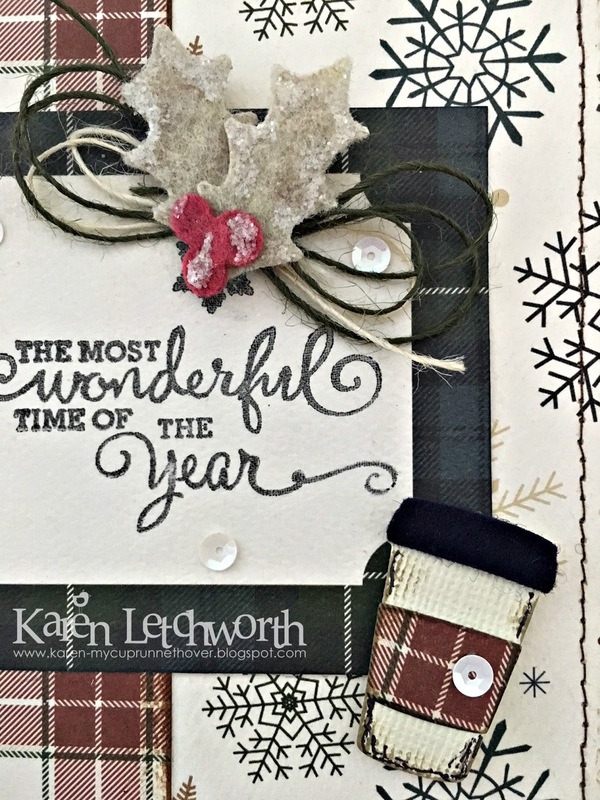 I loved the journalling cards, the plaid prints, and the warm winter colors in this collection. I used the papers and one of the journalling cards, and I stamped my sentiment on it with Tim Holtz Black Soot Distress Ink. I machine stitched the card, inked the edges, and added some sequins. I thank you again for stopping by to say hello! Lovin' the plaid and snowflakes. Great card! awesome colors and loving the plaid. So beautiful and I admire your stitching on it too. It is the most wonderful time - a celebration of ONE who brought us out of darkness into HIS marvelous light - all who follow HIM are blessed - Jesus is the Reason for the Season! What a great design, love the color choice, so pretty! Karen, stunning card. I love how the little coffee sleeve matches the plaid panel. I definitely need that Cabin Fever paper! This is gorgeous! Especially love the little bit of frosty glitter on the holly! sweet card, I luv the glittered holly...swooon! I am so glad you played along with us at simon says stamp wednesday challenge!